Thanksgiving: Girl Praying, a Norman Rockwell painting, appeared on the cover of The Saturday Evening Post published November 27, 1943. This is another timeless favorite of Rockwell collectors, a classic for the ages. An alternate title for the illustration is Refugee Thanksgiving. 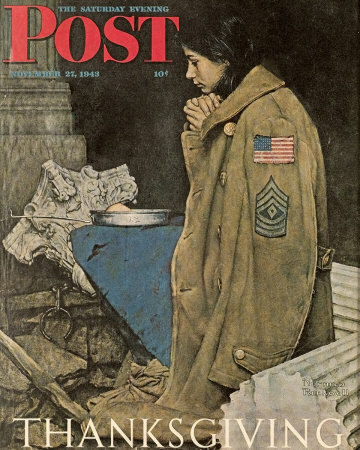 This painting was Rockwell's fifth cover for The Post in 1943. In 1943, there were five Norman Rockwell Saturday Evening Post covers published. This was also Rockwell's 217th cover illustration out of 322 Rockwell painted for the Post. Rockwell's career with the Post spanned 47 years, from his first cover illustration, Boy With Baby Carriage in 1916 to his last, Portrait of John F. Kennedy, in 1963. A photograph used in painting this illustration is reproduced in Norman Rockwell: Behind the Camera by Ron Schick on page 60. The painting itself is also reproduced in that book on page 61. This is one of the most somber Norman Rockwell paintings. It is also a favorite of many collectors. Up to this point in his career with the Saturday Evening Post, Rockwell had not painted many "serious" topics. Most of his cover paintings were lighthearted, humorous subjects. The Willie Gillis series, even though those paintings concerned an American GI in World War Two, were all amusing treatments of that subject matter. This painting is not amusing. It is, in fact, thought provoking. This illustration is, in my opinion, the first Norman Rockwell Post cover to seriously and realistically cover a sincere subject. Especially such a sincere subject matter. Rockwell normally pitched at least two cover ideas at a time. So it could have simply been that the Post editors did not prefer a serious painting from their most famous cover illustrator of all time. As for the painting itself, the scene is war-ravaged Italy. We can seen broken stone columns lying on the ground, surrounding the girl. A broken chain, perhaps meant as a symbol, is pictured, with half of it lying on the ground and half on a nearby wall. The girl is saying grace over a serving of a generous soldier's field rations. We cannot see what the dish is, but is is certainly tastier and more substantial than her usual meal. The war affected everybody and everything in those countries where the fighting was located. The girl also wears an American GI's olive drab field jacket draped over her shoulders. She has not buttoned it against the cold, so the soldier may have just given it to her a moment earlier. Her "shoes" are merely rags wrapped around her feet. And yet she is thankful. This Thanksgiving is better than her previous one. Rockwell has reminded the American people of the devastation they missed. He is reminding us today that a full belly and warm body is a lot to be appreciative of. Thanksgiving: Girl Praying was only one of 322 Norman Rockwell Saturday Evening Post covers; Here is the list of Norman Rockwell Saturday Evening Post cover illustrations. Though not as popular as 1943's Freedom From Want, this Norman Rockwell Thanksgiving image is still just as relevant today as when it was originally published in 1943. It evokes entirely different emotions than 1942's Chef with Thanksgiving Menu . Do You Have A Great Story, Opinion Or Contribution About Thanksgiving: Girl Praying?